This first episode of FAIRPLANET’s Creative Series is dedicated to celebrating imagination as a desperate means to restore dignity in those who have been uprooted and forced into a nomadic life – or have chosen to move on for a better one. We are highlighting ideas that look to the refugee, the migrant, the nomad as the solution, not the problem. We’re pleased to start this series by our collaboration with artist and filmmaker NOAZ DESHE introducing KOUKSI, SARAH, HOME and FLOATING. Texts by Shira Jeczmien, Alex King, Georg Diez and Itamar Mann. We thank WeTransfer for generously supporting this creative series. Floating on an ocean that has taken many lives, how can one fathom the sensation of safety? Welcome to Elpida Home, a non-governmental organisation where the dream of integration co-existing with dignity, self-organisation and respect of cultural difference is a reality. “The dream is in my lyrics.” At the top of the La Savine hill in the French city of Marseille, Sarah dreams of her roots in the East African island of Comoros. Floating on an ocean that has taken many lives before and will take many more still, it’s dark and cold, bodies rub against each other for warmth. A reality of repression and fear has been left behind. What the future has in store is filled with uncertainty. The world of the refugee is tumultus, of that we are aware. Our newspapers are filled with stories of the personal; of individual narratives that desperately strive to reignite an empathy long lost, ever since the terms of the refugee, the migrant, the illegal worker and the many other unclassified statuses in between have become engraved in our reasoning as one thing, and one thing only. But what would a migrant – legal or otherwise – be if she wasn’t what we recognise this position to be? The bureaucratic status of the ‘countryless’ has produced individuals – people with histories and families and memories – who have been forced to think of themselves as victims in need of ‘our’ help. I close my eyes and breathe deeply, slowing my heart rate and injecting a sense of another reality into my imagined surrounding – or trying to at least. You see, I’m in search of ways to experience how imagination can shift my perception of what’s real around me. I’m trying to examine how the application of imagination can help to create change – not just interpersonal, but social or even political. Imagination is so often sectioned into the realm of creativity, of the ethereal, rather than the rational – where politics, and social policies, and international relations reside comfortably all at once. But it’s becoming increasingly apparent that imagination not bureaucracy will restore the lost dignity of the displaced. In the realm of science, this approach is already underway, with medical pioneers turning to science fiction writers to help them imagine what medicine might look like in 100 years. It is precisely the combination of active imagination, together with the distance of turning to professions outside of the field that allow fresh ideas to spur. Perhaps the political realm could learn a thing or two from the universe of fiction, too. Over the last few years, the importance of imagination for change has begun to gain traction – sprouting like mushrooms across the fields of creative (and innovative) means for positive impact. The United Nations’ development of its own virtual reality platform (UNVR) – with numerous stories uploaded onto its site regularly – has opened a door into multi sensorial experiences of the other. From refugee camps in Syria to crossing the Mediterranean sea by boat, virtual reality is a powerful tool to evoke empathy where it’s most desperately needed. This year’s Sheffield Doc/Fest commission was also given to the Future Aleppo project, a virtual reality documentary based on the imagined reconstruction of Aleppo, intricately assembled out of paper by 7th grade Muhammad, who has been forced to leave his country, his childhood and his memories of the neighbourhood he calls home. It is a way of showing that there could be another way, another reality, another image of the refugee, a status other than illegal, another city built on top of a destroyed one. What follows are projects that have been based on ‘the impossible’. Finland is now introducing blockchain bank accounts to its 41,241 new citizens, mostly migrants and asylum seekers from Iraq, Afghanistan, Syria, Somalia and Eritrea. This new technology allows those without documents – a common issue that slows down integration processes and limits the migrant’s accessibility to the country’s systems – to open bank accounts that use blockchain instead of a centralised bank. The simple gesture of a debit card is a crucial first step to rehumanising individuals. By allowing creative innovation to replace outdated bureaucracy, a vessel for new life has been birthed; new thought, newly found dignity and legitimation. By simply committing to the liberation that is inherent to imagination; closing our eyes and succumbing to the possibilities beyond what is our reality right now, worlds could be shifted around. With the help of imagination those who have been forced to live the life of the refugee can become empowered once again. Individualism can be restored – even if for just a split second – and that is paramount for rebuilding broken communities. Because as much as we in Europe and across the world are in need of shifting our own perception of who the economic or political migrant is, the most powerful tools we can invest in are those which shift how the displaced see and acknowledges themselves. Only when the labels of the refugee, the asylum seeker and the migrant are unlinked from their stigmatisation of shame and victimhood can true integration begin to take place. Filmed by Noaz Deshe in the Mediterranean Sea off the Libyan coast and first published with FAIRPLANET's Developing Story Saving Lives. 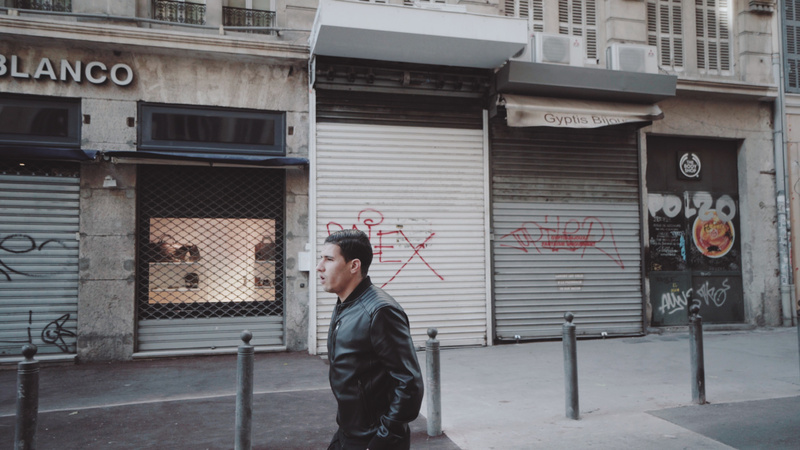 Shot in France under the framework of cinematographic writing residency with Cinema Connection and the MuCEM - Musée des Civilisations de l'Europe et de la Méditerranée - With the support of La Ville de Marseille. Noaz is a Berlin-based artist and filmmaker. Xavier is a Berlin-based editor. Marion is a Berlin-based editor. But who is coming? And are they the same ones who left? In the beginning, there is the story. It is made up, of course, by everyone involved. It is told individually and as a group, it is told among friends and around the fire, it is told in little apartments at the edge of big cities and in small villages out in the nowhere. What is the nowhere? Is there a nowhere? There are always people there. People who are going, people who are coming, people with dreams and ambitions. Think of them. Think of them as you. Think of them as humans, not as numbers. Think of their story. They are, in fact, you. They are strong and good and weak and bad, they are full of fear and need and will prove you wrong. They are the musafir, that's the word for wanderer in Arabic, in Urdu, in Farsi, in Turkish. Most people would call them refugees, but this only means that they haven't listened to their story. Because what does it mean to call someone a refugee? What does it mean to call someone a wanderer? What difference does it make? It makes a huge difference – all language is political. The refugees are powerless and dependent, they are forced out of their home and stranded in limbo, they need help and they are weak. The word alone creates an imbalance of power. A musafir, on the other hand, is a traveller from a strange land, in some languages a pilgrim, a seeker of paths and truths, and in Turkish, a musafir is a guest. But why does this musafir travel? A wonderful Persian phrase comes to mind – that of the ashina-zada, referring to the feeling of desiring the company of strangers. Perhaps this fluid category – of the musafir, motivated by impulses that are not always obvious – is helpful in alluding to the long journeys taken by these people, without diminishing the hardships they have suffered, or pre-judging the reception they will receive in Europe. A musafir seeks out a place, rather than merely being pushed; a musafir is a subject of decision making, not merely an object of persecution. A change not just in terminology, but in perspective. Fact is, between 80 and 100 million people are on the move, mostly displaced within their country or in neighbouring countries, especially in Asia. This number will only grow with the coming ecological crisis. Thinking differently about the refugee will not only be a humanitarian necessity if the people of the world want to live in dignity, it will become a question of survival. The refugee is the major force shaping the 21st century. People are displaced, uprooted, on the move; they are stuck and searching, they are the messengers of the new, and it is necessary to reimagine what it means to be a citizen today and in the nearing future, to have agency and autonomy to integrate the universal experience of the refugee together with the profound changes of technology. This will upend an order of politics and philosophy that is shaped around the western perspective of the nation-state as the guardian of individual freedom and order. The consequence of such global migration is that a sense of insecurity has become pervasive in our time – and that is not something to fear, it is something to embrace. Porous surfaces, makeshift structures, modular thinking, the culture of the experiment, less hierarchy, more fluidity. What if we think of the refugee not as the problem, but as the solution; not as the question, but as the answer? What if we turned everything 180 degrees around and looked at it differently? What if we start with the radical individual and build everything around her and him: a hybrid, an experimental ethic and a horizontal model of governance around this archetype of the past and the future? Where would we look for inspiration? In the past and in the future. Perhaps Europe’s current “crisis” signals a new moment in the shared histories of the world. Perhaps this moment – when nation states in some of the oldest continually inhabited regions of the world (like Syria and Iraq) collapse – shall result in a re-fashioning of the critical categories of thought and language that we are accustomed to. Of course, the horror we see in many parts of the world is real. ُThe harrowing accounts of boatloads of people drowning, of death by asphyxiation in abandoned freight trucks; this horror is visceral and immediate. And so is the horror of residents of island nations, whose homes for centuries will soon be submerged in water, and they will too become displaced. Yet the spectacular amplification of this horror misleads us to believe that the only politically feasible way Europe can engage with this situation is through the trope of humanitarianism. But humanitarianism, at least in its current form, is a highly problematic discourse that tends to redouble the problems it seeks to alleviate. The humanitarian narrative obscures such facts, just like in the years after World War One when it became a criminal offence to seek one’s fortune in a foreign land. This is neither a natural nor a desirable outcome, and we must find ways to be liberated from its homicidal force. The current narrative of “rescuing the desperate” allows European nations and commentators to speak of humanitarian rescue and “European Values” without engaging with the normalisation and eternal policing of borders and residents. What is the process by which it became normal for BMW to invest in an automobile factory in South Africa, but almost impossible for a young woman in a village somewhere in southern Africa to gather money from her network of friends and family, catch a flight to Germany, walk into a government office and register herself as someone seeking a job without constantly fearing imprisonment and deportation? Who has the right to decide that I am Syrian, or German, and what does the act of name and fixing entail? Referring to the musafir is adopting the point of view of a mobile, nomadic form of human existence; by talking about the musafir we can identify problems and offer solutions from the perspective of persons who are constantly on the move. This of course does not mean that such moving persons are “merely” guests who may not insist on full political participation. Rather, we can shift our perception of movement to a form of political participation, and as a way of signaling the outlines of alternative forms of transnational political participation. The “march of the musafir” offers us a moment to reflect on the long shadow of the past century and the strange new categories it presented us with – borders, aliens, people smugglers, camps for those who cross borders without permission. Who are they and why are they coming? Come, listen. Listen to their stories. They are your stories too. This piece derived from the collaboratively written paper "The Philosophy of the Refugee", which considers migration as the starting point of the attempt to create a more contemporary system of global governance. The paper is unpublished as it has been submitted for The New Shape Prize competition by the Global Challenges Foundation. Georg Diez, is a Berlin-based reporter and columnist covering politics and culture for the German newsmagazine Der Spiegel. He is also the co-founder of the experimental journalism platform 60pages, an international network of writers, artists, thinkers and scientists that publishes e-books, long-form journalism, reportage and fiction. Georg is Fellow 2017 of Harvard Universities Nieman Lab for Journalism. Itamar Mann ishttps://www.fairplanet.org/wp-admin/themes.php a senior lecturer at the University of Haifa Faculty of Law, Israel, focusing on human rights, refugee and migration law, international criminal law, national security, and legal and political theory. He has previously worked as a consultant for Human Rights Watch and the Open Society Justice Initiative on issues related to refugee law in Europe. He has also briefly practised human rights and criminal defence law. He is a member of the legal action committee at Global Legal Action Network (GLAN). Before moving to Haifa, Itamar Mann was the National Security Law Fellow at Georgetown Law Center for three years. Itamar is also a contributng creator of the project fishoutofsea.